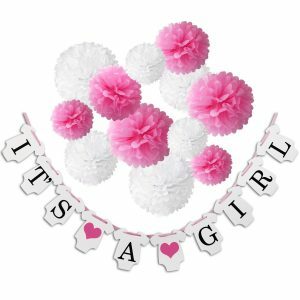 Cool Baby Shower Decorations for Girls – Must See! 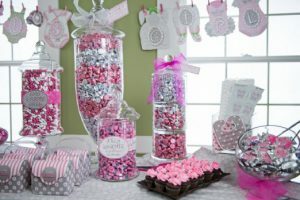 Embellishing with decors for baby showers is a not that hard for girls compared to boys. Why you might ask? Simply because with girls you can not go wrong. There is never too much tulle or glitter for any girly party. 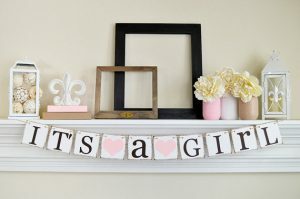 Usually baby shower decorations for girls are easier to find than boys. There are a ton of do-it-yourself crafts for decorations. If you would like to buy some, you can find them everywhere, especially online. 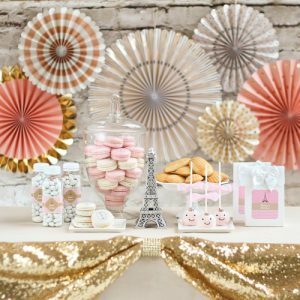 As mentioned many times before, picking a theme for the party is essential as this will lead you to all the decorations for that theme. 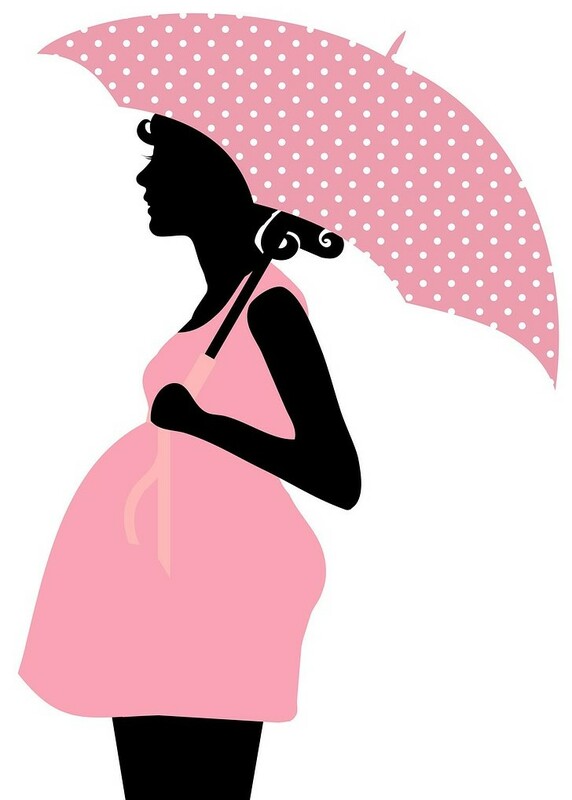 Go to the THEME tab and you will find many baby shower themes for girls. 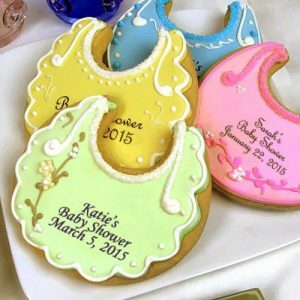 And find out more baby shower ideas for girls. 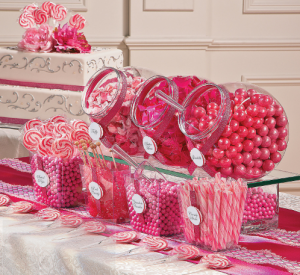 Recreate this candy buffet bar with assorted candies in bulk. Add them in jars (you can get cheap ones at your local dollar store). Get also these mini plastic scoops and you are done! Easy and adds lots of punch to any party! Lots of people sell their homemade decorations online. You can click here to find thousands of beautifully decorations you can not find anywhere else – now that’s unique! 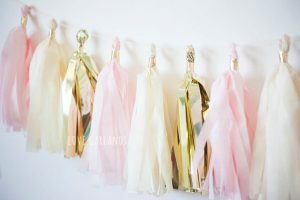 For example, have a look at this cute garland made of metallic gold/soft pink/off white. This can be hanged anywhere around the room. 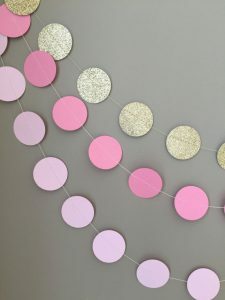 You can have other decorations to add to these garlands such as balloons, of course, and these circle garlands. These below are in hot pink with green which are popular colors these days if you don’t care for the pastel colors. These garlands are sown together with a thread and you can then hang them vertically, horizontally or which ever way you like. Some even match your theme like elephant or star…You can also have matching confetti to spread over the tables. 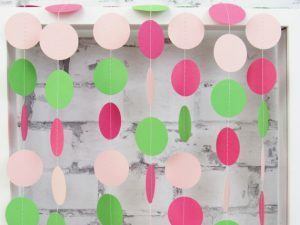 Use these garlands for a back drop (they come in different colors) – for photos, behind the candy bar or hang them from ceiling like the picture below. They are 11.8 feet long and you get 6 of them. You can always tape two together to make it longer. Great way to cover a wall in a cheap way. Continuing with paper decorations, a banner is a MUST. Why? 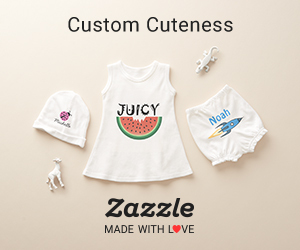 Because not only it’s the focal point but it provides an extra décor that can be personalized, such as adding baby’s name. 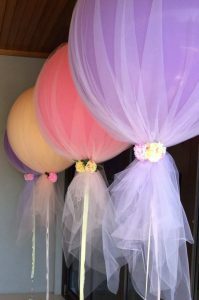 How about this super easy way of decorating balloons with tulle. Just wrap some tulle to a balloon, tie with a cord and add some embellishment such as craft flowers or plastic mini pacifiers. 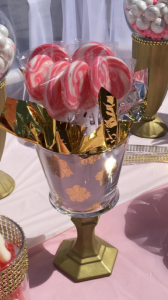 They kind of look like giant lollipops! 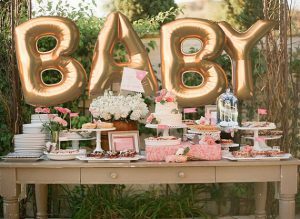 It’s a Girl is usually what people chose, however if the hostess knows the baby name – you can add the name instead. 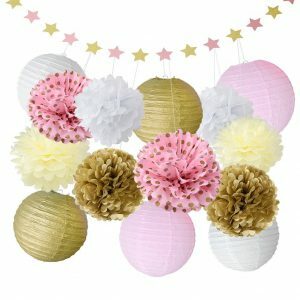 When you are looking for bulk decorations, consider buying kits. 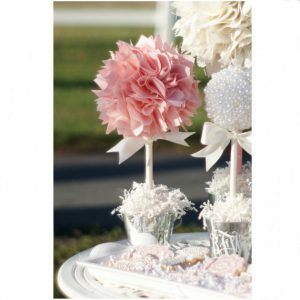 Decoration kits have few items you can use such as banner, paper lanterns, tissue pompoms. Grab more items such as balloons or confetti to complete the bundle kit. 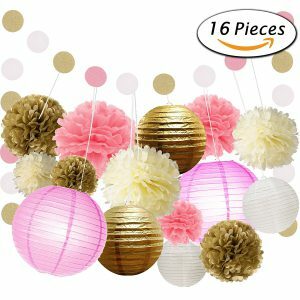 Lastly, I love paper lanterns and tissue pompoms – This one is a great 16 piece bundle and priced only at $13.59! 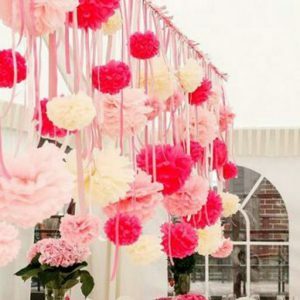 Here is another way of hanging tissue Pom Poms from the ceiling with strings at different heights. Add extra strings (curl them with scissors) and you’ve got yourself a nice and cheap way of decorating. TIP: Instead of hanging them one by one, tape them first on a sturdy stick/pole, then secure it well on the ceiling. Add some bling with glitter strings. The great thing about these, they come in many different colors and sizes. 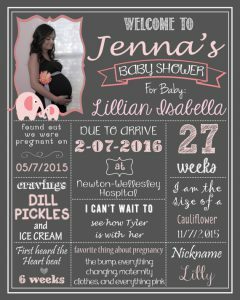 I often find these cute welcome signs adorable especially the ones that have personal info on the baby such as cravings, first hear beat, due date, favorite thing about pregnancy,…The below one is personalized with even with mom’s picture. Love it! (of course this can be for a baby boy). 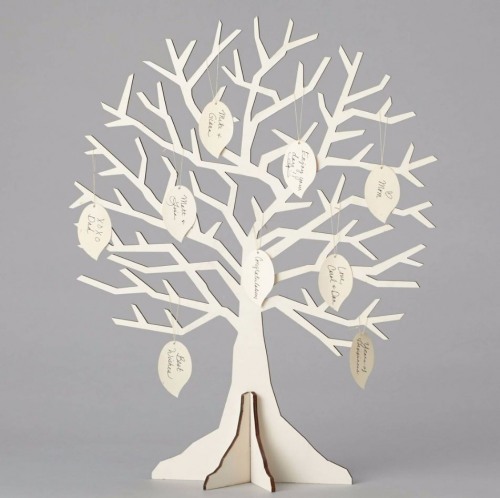 Have this at the front entrance so guests an write a wish for baby. This is a DIY kit. You can decorate it the way you like. Another great idea for decorations is simple but gives a big impact, this is the giant BABY mylar balloon. 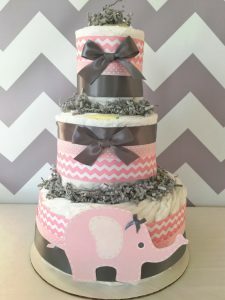 A 3-tier elephant theme diaper cake in pink and grey. The chevron ribbons give a nice touch. Here are pretty topiaries you can buy online. Get a few in different heights and shapes to make a big effect. 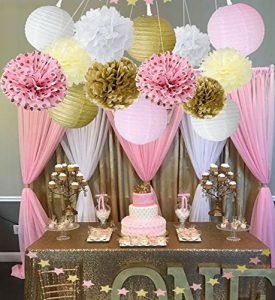 If you don’t want to buy or make centerpieces, you can always display baby shower gifts for girls in tier/pyramid shape on the main table. These can gifts same as theme or not theme related. I’ve seen a beautiful display of gifts centered on the table; from bath tubs to stuffed animals. Favors can add to your decor. A tray of little gifts for guests can be displayed on the table and everyone can grab one when the leave the party. Food can be also part of the decor. Depending on what theme you have you can make many desserts with the color of your theme. 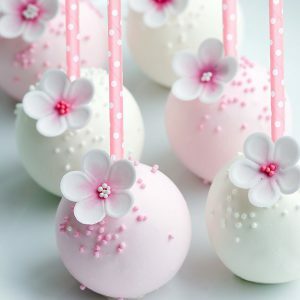 Such as these cute pink and white cake pops. You can make them with this simple cake pop maker. 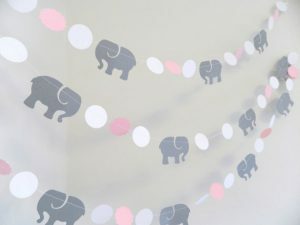 I hope you have found some great ideas and if you plan to throw another party for a boy, check out baby boy shower decorations.